This is my baby candy doll! 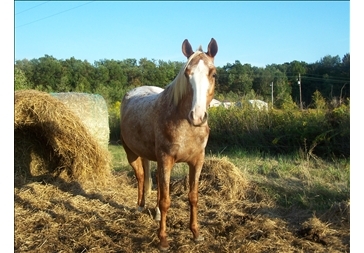 Well for one that's the name of my appaloosa mare and she looks like cotton candy. It is usually sweet and is just the best! I had a Golden Palomino named Candy she past away in 2007 she was the sweetest horse I have ever owned, she died at the age of 29yrs old... I was the only one that could go out to the pasture to call her name and she would come right to me... she wasn't a very trusting horse to just anyone, The people I bought her from use to abuse her she didn't like men at all.. My husband use to get so mad cause he had to come get me to catch her because she wouldn't even come up to the kids either.... I thought it was so funny cause he is the cowboy and I was just the wont to be cowgirl..lol!! Candy was the greatest horse, it's a beautiful name!!! We breed appys. We Have; Long Sox (Pippi) a 10 year old mare. Lucey Loo (Red) a 8 year old mare. Carla's Midnight Bella Luna (Luna) a 4 year old gelding. I am a little odd, I am own a 18 year old mustang named Cinder. Pippi looks an appaloosa but Red and Luna do not. Cinder is very odd. He is not part of the family. Cinder is a different breed of horse. He is about 3 hands smaller then the smallest appaloosa. When I ride, I am about a foot smaller then my sister and my friend. Candy is not the name that would couch for our next foal, but You have a very beautiful horse. P.s. If you wont to any pictures of horses that we own you can contact me. P.s.s Cinder is a very cute horse. Pippi is very fat.